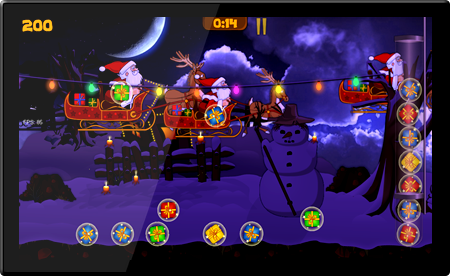 Kids will love tapping on flying Santas to drop some coloured presents for them! Dropped boxes can then be picked up by tapping or dragging your finger. – Each colour has different score value. – Try to combine 2 same colours to get time bonus and empty some room in your “test tube”. – Christmas sounds (jingle bells, Hohoho ;)) and music (Silent Night theme on piano). – Absolutely FREE with no advertisements.